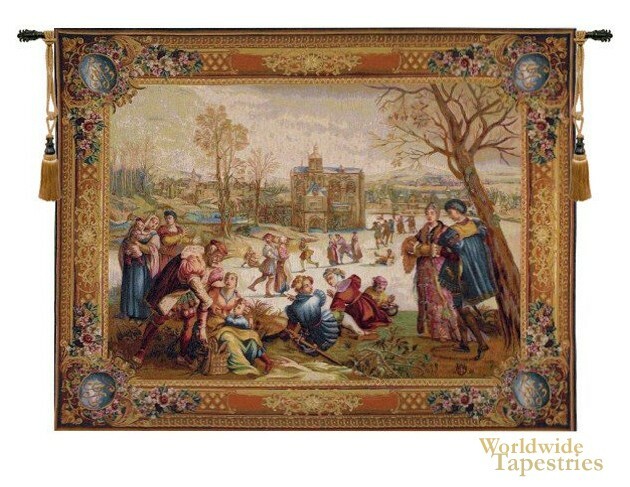 Taken from a set of tapestries known as Mois de Lucas, Les Patineurs tapestry was first woven in the 18th century by Gobelins Manufacture in France. It is based on the work of a number of artists, which was then enhanced by Gobelin’s artists and weavers into the form you see here. The scene depicts “Les Patineurs” (the skaters) enjoying an afternoon by a frozen lake. The work is not only a study in fine weaving and control of color, but of period fashion as well. The original Gobelins tapestry was woven in 1770 and is in the Elysee Palace, the home used by the president of France to entertain foreign guests. This reproduction is faithful to the original. Les Patineurs tapestry is lined and has a tunnel for easy hanging. Note: tapestry rod, tassels, and accessories, where pictured, are not included in the price. Note: tapestry rod and tassels, where pictured, are purchased separately.